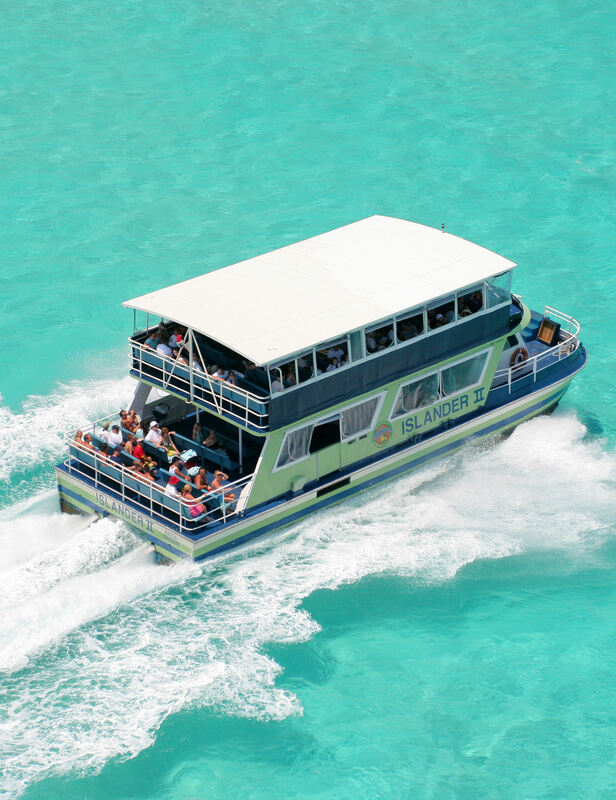 You are sure to enjoy the scenic boat ride on our high-speed catamarans that allows you to view many of the main attractions in the Bahamas. See Nassau's historic and scenic harbor as you cruise by Paradise Island and Nassau to beautiful Blue Lagoon Island, a private island and home of Dolphin Encounters and the stars of Universal's Flipper movie. As an observer, your program includes the fun interactive orientation, briefly covering the natural history of dolphins, animal training techniques, ocean conservation and Watchable Wildlife Guidelines. Once there, watch a friend or family member as they come "face to fins" with dolphins in our amazing Dolphin Encounter or Dolphin Swim program or our Sea Lion Encounter. Enjoy the up-close and personal view of these gentle marine mammals from a nearby platform - as you remain high and dry. At the program areas you can take your own photos or videos from the public dock areas. However, be advised we cannot guarantee an unobstructed view of all dolphin interactions & observers are not allowed on the platforms at any time. Sorry no exceptions. Visit the Sea Lion habitat, the home of our California sea lions that were rescued from Gulfport, Mississippi in the aftermath of Hurricane Katrina - including the stars of the movie Andre and Slappy and the Stinkers. Enjoy shopping in the gift shop or refreshments overlooking spectacular ocean views. Take in the beauty of the natural surroundings that has made the island and the facility a must-see for visitors and tourists in the Bahamas. Please note this tour can only be booked in conjunction with a Dolphin or Sea Lion Encounter or Swim. Guests ages three (3) and younger may observe for free if accompanied by a responsible paying adult with an observer tickets. Parent or guardian must be at least eighteen (18) years old. Children four (4) years and older must have a ticket and be accompanied by a responsible adult eighteen (18) years or older with an observer's ticket. You can take your own photos or videos from the public dock however, we cannot guarantee an unobstructed view of all dolphin interactions & observers are not allowed on the platforms at any time - no exceptions. This tour can only be booked in conjunction with a Dolphin or Sea Lion Encounter or Swim. For boating purposes, motorized power chairs and noncollapsible wheelchairs are not allowed on our boats. The beach closes at 4:00pm.